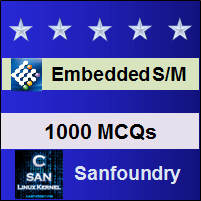 This set of Embedded Systems Multiple Choice Questions & Answers (MCQs) focuses on “Levels of Hardware Modelling”. 1. Which of the following is an analogue extension of the VHDL? Explanation: The VHDL-AMS is the extension of the VHDL and this includes the analogue and mixed behaviour of the signals. 2. Which of the following support the modelling partial differentiation equation? Explanation: There are a variety of levels for designing the embedded systems and each level has its own language. The system level is one such kind which has many peculiarities with respect to the other levels. The system model denotes the entire embedded system and includes the mechanical as well as the information processing aspects. This also supports the modelling of the partial differential equations, which is a key requirement in the modelling. 3. Which level simulates the algorithms that are used within the embedded systems? Explanation: The algorithmic level simulates the algorithm which is used within in the embedded system. 4. Which level model components like ALU, memories registers, muxes and decoders? Explanation: The register-transfer level modelling models all the components like the arithmetic and logical unit(ALU), memories, registers, muxes, decoders etc and this modelling is always cycled truly. 5. Which of the following is the most frequently used circuit-level model? Explanation: The SPICE is simulation program with integrated circuit emphasis, which is a frequently used circuit-level in the early days. It is used to find the behavior and the integrity of the circuit. 6. Which model includes geometric information? Explanation: The layout reflects the actual circuit model. It includes the geometric information and cannot be simulated directly since it does not provide the information regarding the behavior. 7. Which model cannot simulate directly? Explanation: The layout model reflects the actual circuit model and this includes the geometric information and this model cannot be simulated directly because it does not provide the information regarding the behavior. 8. Which of the following models the components like resistors, capacitors etc? Explanation: The circuit-level model simulation is used for the circuit theory and its components such as the resistors, inductors, capacitors, voltage sources, current sources. This simulation also involves the partial differential equations. 9. Which model uses transistors as their basic components? Explanation: The switch model can be used in the simulation of the transistors since the transistor is the very basic component in a switch. It is capable of reflecting bidirectional transferring of the information. 10. Which model is used to denote the boolean functions? Explanation: The gate level model is used to denote the boolean functions and the simulation only consider the behaviour of the gate. 11. Which model is used for the power estimation? Explanation: The gate level model is used to denote the boolean functions and the simulation only consider the behaviour of the gate. This model is also useful in the power estimation since it provides accurate information about the signal transition probabilities. 12. In which model, the effect of instruction is simulated and their timing is not considered? Explanation: The coarse-grained model is a kind of the instruction set level modelling in which only the effect of instruction is simulated and the timing is not considered. The information which is provided in the manual is sufficient for this type of modelling. 13. Which models communicate between the components? Explanation: The transaction level modelling is a type of instruction set level model. This modelling helps in the modelling of components which is used for the communication purpose. It also models the transaction, such as read and writes cycles. 14. Which of the following has a cycle-true set of simulation? Explanation: The fine-grained model has the cycle-true instruction set simulation. In this modelling, it is possible to compute the exact number of clock cycles which is required to run an application.